Just found that you can get Mario Odyssey for £31.99 or Mario + Rabbids kingdom battle for £30, just enter code TENNOW at the checkout to get £10 off a £40 shop. 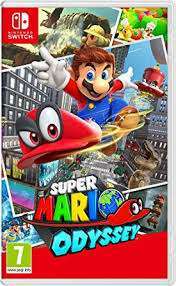 With Mario Odyssey, currently priced at £31.99 or Mario + Rabbids at 39.85 (just add items to your basket so it adds up to £40 or over), its a good way to get these games around £30 each (requires multiple amazon prime accounts). Please note that the code only works with first time orders so create a new account and sign up to prime for a trial period. (edit: this deal also showcased FIFA 18 for £30 however this has now expired). Aw man, amazing deal- wish there was Prime Now in Northern Ireland! Amazing deal, great first post! Mario & Rabbids AND FIFA 18 for £30? Back of the net, OP. Correct or if you already have a prime account and have never ordered anything through Amazon Prime Now before. I will need to also order some oven gloves as this could be a hot deal to handle. Fantastic deal. I will need to also order some oven gloves as this could …Fantastic deal. I will need to also order some oven gloves as this could be a hot deal to handle. Here you go primenow.amazon.co.uk/dp/…X9I add this to the total so it get you to £40. Now the deals really in the palm of your hands, enjoy. Nice deal indeed but I think it's partially expired as I can't find Odyssey or FIFA listed anymore. I think its based on the location and its local stock. Just got Splatoon 2 for 33.99 and delivered in 2 hours! Bargain, thanks! I think its based the location and its local stock. Ah, thank you. I'm new to Prime Now so not up with how it works. Can’t get the code to work, set up new account and says it’s not valid? Worked for me just now. Thanks OP. Grabbed Evil Within 2, Wolfenstein II and a pack of Wrigleys Extra for £30.38! Worked for me just now. Thanks OP. Grabbed Evil Within 2, Wolfenstein II …Worked for me just now. Thanks OP. Grabbed Evil Within 2, Wolfenstein II and a pack of Wrigleys Extra for £30.38! you have to make sure that your account is signed up to amazon prime, they usually offer a 30 day trial for new accounts which you can cancel within the 30 day period. Great spot and can be used for anything over £40 obviously. Ordered MARIO from PO postcode for 2hr delivery. Thanks again. tried some other postcodes and found Mario Odyssey near the outlaws so ordered. Bought! Now to sell my digital Mario Code. Cracking deal, unfortunately Mario seems sold out at every postcode I could reasonably get it delivered to. Any idea how long the code is about for? Received today. But wouldn't you know, managed to get it for £29.99 from Gameseek Cyclonic Deal. Just sold the Prime Now copy for £35. So I'm happy. Last time I tried using prime now, I saw at checkout that you can choose to tip the delivery man (with a default amount set). What is the deal with that?? Last time I tried using prime now, I saw at checkout that you can choose …Last time I tried using prime now, I saw at checkout that you can choose to tip the delivery man (with a default amount set). What is the deal with that?? I dunno, just set it to zero and put the wife's name on the order. Mario Odyssey is £39.99 now. Big price bump. Odyssey isn't on there anymore. Deal posting newbie! This is cactus_mack first deal post. Help out by leaving a posting tip or just to show your appreciation for their contribution.